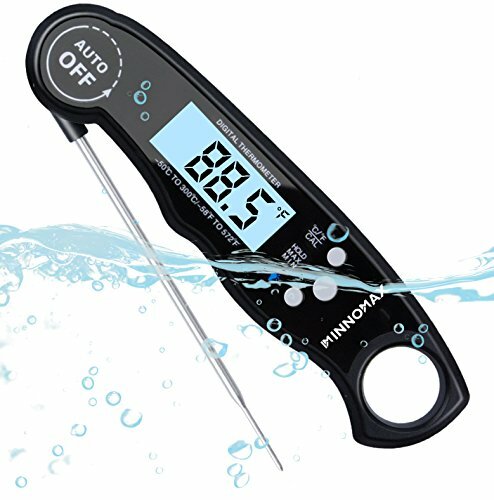 ✅ Waterproof and Back Light - The IP67 Waterproof design of INNOMAX Instant Food Thermometer make it available to be washed under Running Water and provide stable performance of measuring Soup, Coffee, Deep frying, BBQ with more Liquid. With Large LCD Screen and Bright Back Light, you can still watch temperature reading clearly when BBQ take place at night outside. ✅ Fast and Accurate Reading - Applied with Medical Thermometer technology, INNOMAX Instant Read Thermometer give you readings just within 2-3 seconds and give a accurate wide reading range of -58℉-572℉ at +/-1 degrees. ✅ Long Prob with 180 Rotating - INNOMAX BBQ Thermometer\'s probe was made of food grade stainless steel to provide you a healthy life. The 4.4 inches long probe and 180 degree rotating design allow you to measure different size meat and make the food well cooked. Auto Power on/ Off when you open or close the probe. ✅ Holding Friendly Design - The 6.1 inches Long Holder is made of strong ABS plastic with Holding Friendly Design which will make it to be used friendly while measuring large size meat.